Ideal for low power (nanoWatt) and connectivity applications that require precision analog (12-bit ADC). Applications can also benefit from the availability of three serial ports: FS-USB (12 Mbit/s), I²C™ and SPI™ (up to 10Mbit/s) and an asynchronous (LIN capable) serial port (EUSART). Large amounts of RAM memory for buffering and Enhanced FLASH program memory make it ideal for embedded control and monitoring applications that require periodic connection with a (legacy free) Personal Computer via USB for data upload/download and/or firmware updates. 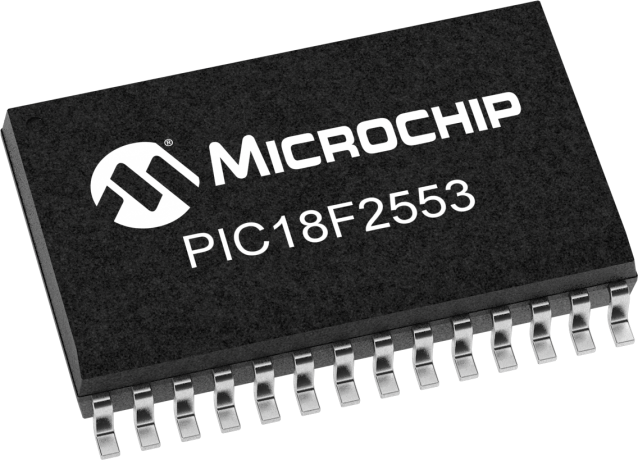 While operating up to 48 MHz, the PIC18F2553 is also mostly software and hardware compatible with the PIC16C745 Low-Speed USB OTP devices. THE PICSTART® Plus does NOT currently support this device but may support it in the future.